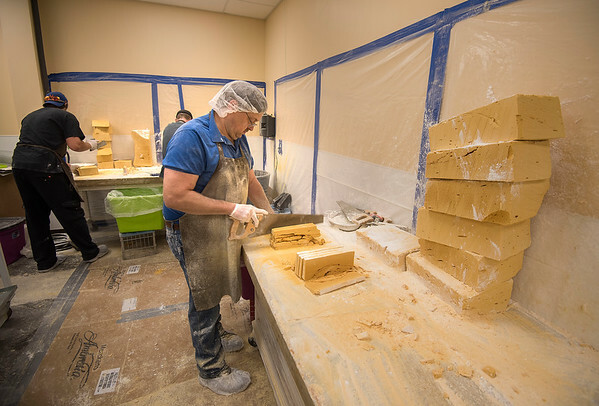 Niagara Falls, NY - Platters Chocolate Factory worker Dave Wrazin and crew cut up fresh sponge candy in preparation for chocolate coating. Platters Chocolate Factory in the Wurlitzer Building, is hosting the 1st Annual Sponge Candy Fest from September 21-23rd. Thursday was All Day Sponge sampling, Friday its Beer & Chocolate Pairing and Saturday there is a 5K run and artisan market with proceeds to benefit the Texas and Florida hurricane victims.